The all-new Audi A8 has finally been revealed at the Audi Summit 2017 in Barcelona, Spain. The new range topping A8 sedan, sports new sheet metal on top of an all new space frame. 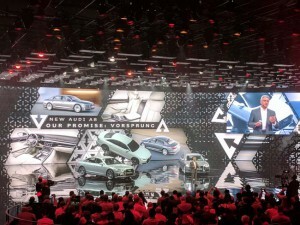 The latest generation Audi A8 has adopted many of the styling cues present in the Audi Prologue Concept shown at the Los Angeles Auto Show in 2014. 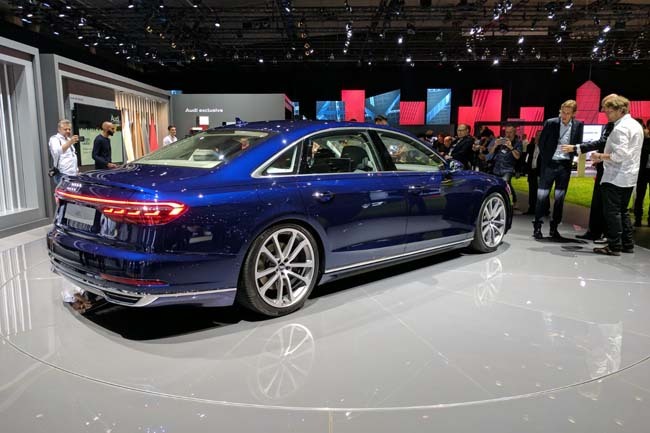 Head of Audi Design, Marc Lichte, proudly revealed that the new A8 is the first vehicle he has taken from white paper to production since he began his tenure. Front and centre on the Audi A8 is a new lower, wider single frame grille. A new LED headlight array has also been integrated into the front end design. In Europe, buyers will benefit from available Matrix LED and laser head-lighting systems. Designer Marc Lichte has shortened the shoulder line of the car along the sides, which now only runs between the front and rear wheels. Mr. Lichte offered that the truncated line allows for a more muscular presence around the wheels. The side profile of the car has evolved from a straight sedan shape to one more in line with that of a 4 door coupe. The C pillar at the rear frames a long sloping rear window. The effect seems to lower the overall profile of the car but in actual fact, Mr. Lichte advises that there is an extra 20mm of headroom in the rear seat over the last generation A8. Exterior lighting is a major design element with the Audi A8. Up front, the models shown at the launch featured distinctive front lights, with laser and LED Matrix lighting. At the rear, a single horizontal bar of OLED lighting spans the entire width under the trunk lid. The rear lighting is a bold departure from traditional Audi design. 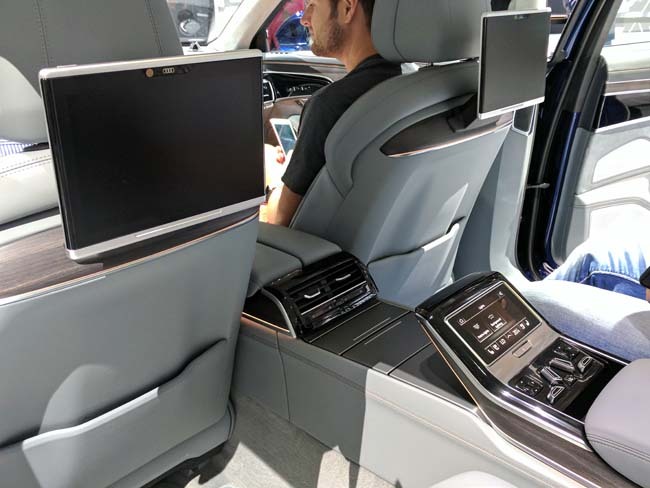 Inside the car, a host of new technology was showcased, much of it focusing on autonomous driving and passenger comfort. Many of the technologies shown will not come to market in the near future and were shown as a proof of concept, that if allowed by legislation, Audi could implement. At the top of the list was a traffic jam driver’s assist system. If allowed, the vehicle would use optical monitoring, GPS as well as LIDAR (laser radar mapping) to move the vehicle along in stop and go traffic while the driver would be free to dedicate his attention elsewhere, without having his or her hands on the wheel. One piece of technology that will be offered is a self-parking feature. The system allows drivers to exit the car, press a button and the vehicle manoeuvres into a garage or parking spot. A revised interior was also revealed. 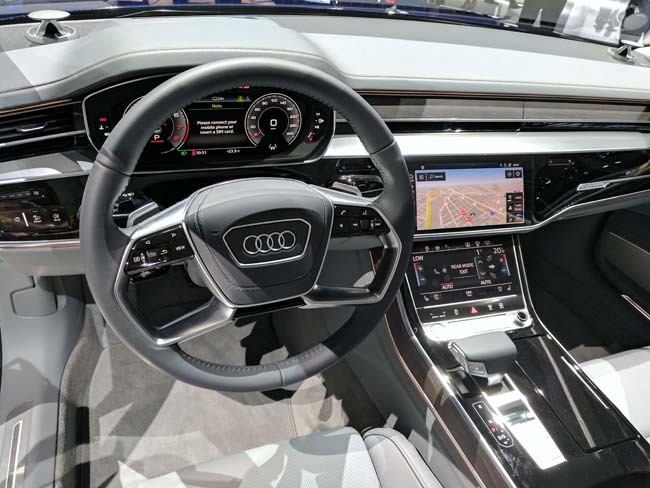 Audi has followed up the wrap around dashboard elements of the A7 and has gone with a blend of black glass screens and shiny black acrylics that give the effect of an all glass cabin, similar to one found in aircraft. Traditional switchgear was almost non-existent. The vehicles systems controls have been moved to the virtual realm inside menus on screens. As daunting as that may seem, Audi showcased the interface for these controls and in a surprising move, have adopted the interface properties of smart phones, with gestures of spreading, pinching and touching. The almost intuitive actions make the Audi’s revised Multi Media Interface (MMI) a breeze to use. Passengers in the rear seats were not forgotten. The black glass interface carries over and a smaller MMI screen sits between the rear passengers. The control model actually detaches and can control climate parameters for the rear, raise and lower windows and shades remotely, as well as, select entertainment to enjoy. One passenger comfort feature that I have not seen before was an available foot massager that faced the rear passengers from the back of the front seats. Under the hood, the new A8 will debut with a pair of V6 engines, followed by a pair of V8 engines and a plug-in hybrid system on the A8L. Eventually a W12 engined model will be available. All-wheel steering will also be included to sharpen the handling of this large, premium sedan. No release date was given for the new Audi A8 but one can expect that the vehicle will likely go on sale in 2018 as a 2019 model. The last generation Audi A8 was also revealed at an intimate private gathering, the Design Miami event in Miami Beach Florida in 2009. 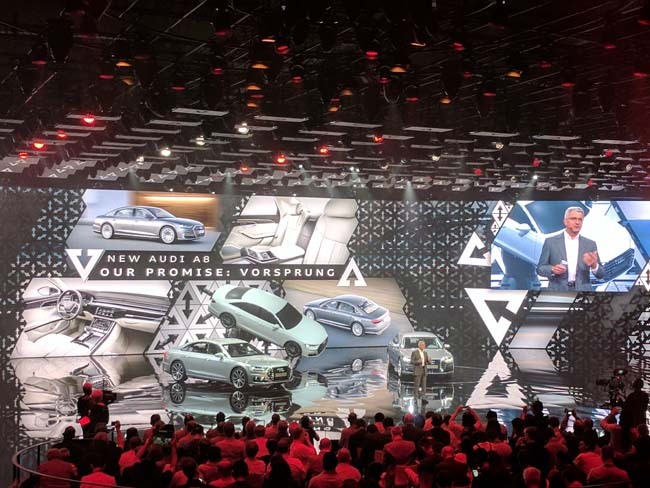 The Audi Summit 2017 was an invite only event for the World’s automotive press to gather and not only see Audi latest flagship sedan but also a chance to give the media a peek into the future of Audi as well as Audi’s vision of motoring in the century to come. Many executives spoke about how Audi was enhancing the companies offerings to an evolving market. Without specific products being worked on, Audi board members commented on adapting to the sharing economy, the growing increase in automation and the need to make technology ease the stresses of our day to day lives. Audi sees automation as a means to give back more free time to its owners. They have branded the concept the 25th Hour, that extra hour of free time that automation in the car will give back in productivity or enjoyment. Reference was also made to the notion that Audi was branching into becoming a technology company rather than simply a car manufacturer. It will be interesting to see how far Audi can push the envelope within the framework of government legislation that varies greatly around the Globe. 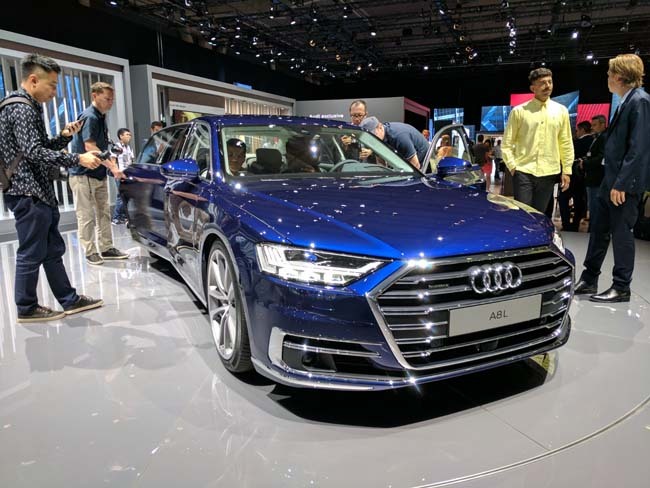 This brand new Audi A8 sedan will be coming to our shores sometime next year with a bold new look, a raft of new technology and we cannot wait to drive it.